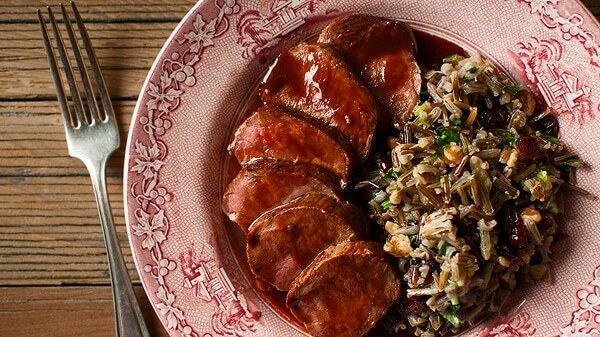 If there is a classic way to eat venison, this is it. Venison backstrap, which is the loin of the animal (like a ribeye or pork chop), seared medium-rare and served with this sauce. 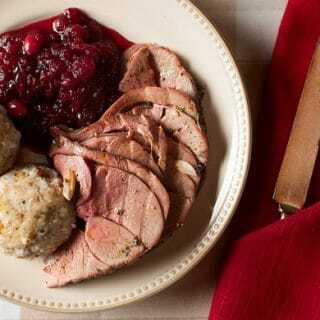 Cumberland sauce, which hinges on the tart-and-sweet red currant, is perhaps the oldest wild game sauce still commonly made today. It dates from at least the 18th century, and has been modified only a little since then. The great food writer Jane Grigson, in her Fruit Book, writes that the first real reference to a Cumberland-like sauce is in Hannah Glasse’s 1747 cookbook, The Art of Cookery Made Plain and Easy. Glasse’s version of the sauce includes red currants, red wine, sugar and red wine vinegar; it’s basically a modern gastrique. The addition of Port wine and meat stock to the sauce arrives by 1817, and the sauce as we know it now — with the addition of mustard and citrus — is fully formed by 1846. What’s the big deal about Cumberland sauce, and why should it persist so long in our kitchens? Because it is a perfect balance of sweet, spicy, savory and salty. Whenever you achieve this balance in cooking, people will remember you… or at least your food. A good barbecue sauce hits all these notes, as does all proper Vietnamese food. Red currants, either in jelly or syrup or as whole fruits. You can substitute other tart red fruit, however, and I’ve used cranberries, highbush cranberries, lingonberries and even raspberries with good results. Red wine or Port. No substitute, so if you cannot use alcohol in your cooking, you are out of luck. You can make a facsimile of Cumberland without wine, but it will not be the same sauce. Citrus. Most recipes have either lemon or orange zest plus some juice, too. If you can ever get your hands on bitter Seville oranges, they are what was historically used. Meat stock. As we just saw, the oldest versions of Cumberland don’t have this, but the addition of meat stock — especially demi-glace or glace de viande – adds a lot to the flavor. If you don’t have demi, use regular stock and boil it down. Only be very careful about any other salt in the sauce, as the boiled-down stock will get very salty. Spices. English dry mustard (Coleman’s) is almost always used, and so is freshly ground black pepper. And I mean freshly ground: It makes a difference in this case, as black pepper is one of the primary flavors in this sauce. A lot of recipes also add a pinch of cayenne pepper. This might sound modern, but keep in mind that cayenne starts appearing in European food as early as the 1600s. The iconic French chef Auguste Escoffier added ground ginger to his version of Cumberland. You can certainly make Cumberland sauce on the side, or you can do as I do and make it as a pan sauce when you are done cooking. I prefer this method because it takes advantage of the browned bits in the saute pan and uses fewer pots, which means less to clean up afterwards. And you need not restrict yourself to venison here. Cumberland has been used for hare, lamb, duck and goose since it was invented. 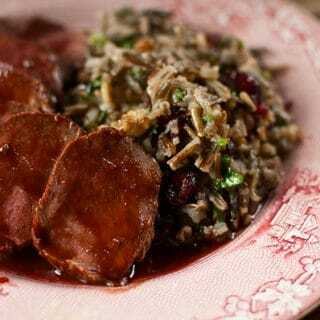 It is one of my all-time favorite sauces for a simply seared duck breast, wild or domestic. What goes well with Cumberland on the plate? I like simple mashed potatoes, but boiled or baked potatoes are just as good. Polenta or fried hominy is excellent, as would any other mashed root vegetable. Or go simple and just serve it with a green salad and some nice, crusty bread. You would be surprised how easy it is to find red currant jelly in supermarkets. Every decent-sized one will carry it, and I've even found currant jelly in towns as small as Fayette, Missouri, and Ashley, North Dakota. If you really can't find it, though, use lingonberry or cranberry jelly. Raspberry is not as good a substitute. Oh, and if you can find syrup of any of these fruits, get that -- it dissolves easier in the sauce. Melt the butter in a saute pan large enough to hold the venison backstrap over medium-high heat. When it's hot, turn the heat down to medium and brown the venison on all sides. Use the finger test for doneness to cook the meat to the level you want. I prefer medium-rare. Remember it will continue to cook as it rests, so take it out a little before it reaches the doneness you want. Move the meat to a cutting board, tent loosely with foil and let it rest while you make the sauce. When your meat has come out of the pan, make sure there is at least 1 tablespoon of butter or oil in it. If not, add more. Saute the shallot over medium-high heat for 90 seconds, just until it softens. Don't let it burn. Add the Port wine and use a wooden spoon to scrape up any browned bits stuck to the pan. Let this boil furiously until it is reduced by half. Add the demi-glace (or stock), the salt, citrus zest, mustard and cayenne and let this boil for a minute or two. Stir in the red currant jelly and the black pepper. Let all this boil down until it is thick, but still pourable. You can strain it if you want a more refined sauce. I make my own demi-glace (really glace de viande), but it takes some time to make. You can buy it at specialty markets (it's shelf stable), or you can buy it online. Cumberland sauce stores well for a couple days, and is surprisingly good cool or at room temperature; the English serve it cool with cold meats. 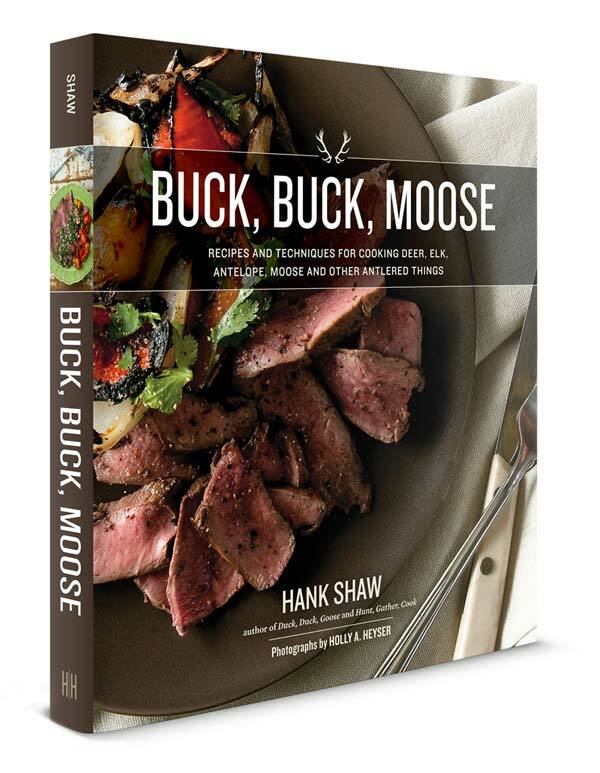 Explore nearly 100 recipes for every kind and every cut of venison, right here on Hunter Angler Gardener Cook! I very rarely comment online, but this recipe is wonderful. Made as written using reduced homemade beef stock (omitted extra salt as a result) and fresh cow elk backstrap. I didn’t have a chance to ask what anyone thought– I was too busy trying to figure out how to sneak the last slice onto my plate without someone stabbing my hand with a fork. There was a little sauce left over, which I’ll use on elk burgers the next time we need a treat. Thank you! I just made this with a fat juicy rabbit I caught, I made a demi glace out of it and used that as the demi glace in this dish and it came out amazing served with a mixture of spinach,kale,and chard over some rice with the seared and roasted rabbit chunks. I usually marinate my meet in buttermilk to take out the strong gamey taste. This sauce perfectly compliments the meat without removing that gamey taste! My backstrap was pre-medallioned by the the butcher (we know the butcher takes the best cuts… my dad is just lazy and won’t clean his own deer), I didn’t strain my sauce, and 1.5 times the cayenne because I like spicier foods. Great recipe! I give gifts of quart jars of cumberland sauce at christmas. for such a traditional sauce, many cooks have never made it. hunters get very delighted for it is most delicious. good with sausages, chicken, pork, leg of lamb as well as venison.